James Karman G’76 found his passion as an undergraduate at Augustana College, and it has never left him. It is a passion for the poet Robinson Jeffers, not so well known today but hugely famous in the 1920s, ’30s, and ’40s—so much so that he graced the cover of Time magazine in 1932. “He is a poet that matters,” says Karman. Karman went on to earn his master’s degree in religion at the University of Iowa, then looked around for a doctoral program in which he could combine his interest in religion with studies in literature. “The interdisciplinary curriculum at Syracuse,” says Karman, “was the very best in the country at that time—not just for religion and literature, but for religion and psychology, philosophy, and other fields as well. Outstanding faculty members included Stanley Romaine Hopper, David Miller, Huston Smith, Gabriel Vahanian and James Wiggins. 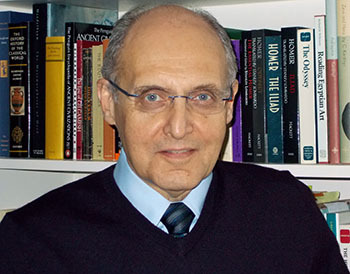 After receiving his Ph.D., Karman headed for California permanently, where he had secured a teaching position at California State University, Chico. He started out in the religion department, where he taught in an interdisciplinary program. After a few years he switched to the English department, where he remained for about 18 years, then he finished up back in the religion department. Altogether, he taught for 27 years before taking early retirement about 10 years ago so he could devote himself to his Jeffers scholarship. He is also a trustee of the Robinson Jeffers Tor House Foundation (the stone home the poet built and lived in with his family on the California coast) and a past president of the Robinson Jeffers Association. What is it about Jeffers that has kept Karman fascinated throughout his career? Karman says that he is a visionary poet who understood the past, present and likely future of Western civilization. He worked imaginatively with the West’s Greco-Roman and Judeo-Christian traditions, while looking beyond both of them. Moreover, his own unique religious vision of life was rooted in the leading scientific theories of his time. Jeffers was also innovative as a craftsman, says Karman, taking his rhythms from “the rhythms of life, such as heartbeats and the sound of ocean waves rolling onto the shore.” He contributed to the modern environmental movement and wrote extensively about the beauty of the California coast. He was characterized as “inhumanist” because of his belief that humans should not be seen as being at the center of things. Starting at the end of the 1930s, Jeffers’ popularity began to decline, partially because of his opposition to war. Though he was prolific throughout his life (he died in 1962), he was never again as popular as he had been in his earlier years. 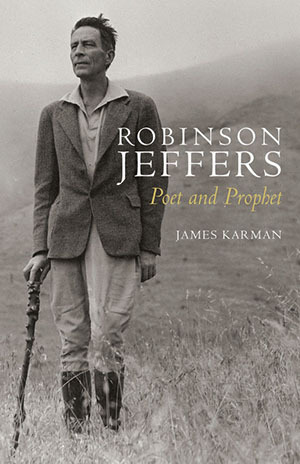 In 2015, Stanford University Press published the third and final volume of Karman’s “Collected Letters of Robinson Jeffers, with Selected Letters of Una Jeffers” and a biography titled “Robinson Jeffers: Poet and Prophet.” For this achievement, the Commonwealth Club of California presented Karman with its 2016 Notable Contribution to Publishing Prize; the Book Club of California recognized him with its 2016 Oscar Lewis Award for Outstanding Contributions to Western History; and the Robinson Jeffers Association honored him with its Lawrence Clark Powell Award for Distinguished Scholarship. Karman says he is not done with Jeffers yet, though he declines to give more detail. But be assured, he is still hard at work reclaiming the reputation of one of the 20th century’s notable poets.